A move by the Trump administration to narrow the number of Americans who qualify for food assistance has been met with strong opposition from Maine’s two senators and U.S. Rep. Chellie Pingree, a 1st District Democrat. But U.S. Rep. Jared Golden, a 2nd District Democrat, is taking more of a wait-and-see position on a proposed rule change at the Department of Agriculture that would tighten work requirement provisions in places where unemployment rates have dropped. Basically, President Donald Trump is seeking to broadly expand the work requirements Maine already imposed in 2015 on recipients of the Supplemental Nutrition Assistance Program, known as SNAP benefits. 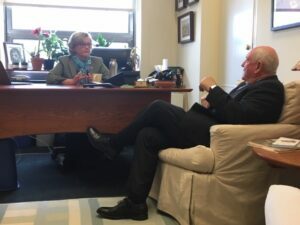 “Based on experiences in my home state of Maine, I believe this proposed rule is misguided and ignores the complexities of food insecurity,” Pingree wrote in a letter to Secretary of Agriculture Sonny Perdue. The SNAP program in Maine already limits benefits for non-disabled adults without young children — referred to by bureaucrats as Able-Bodied Adults Without Dependents — to no more than three months during a three-year period. Its existing program would not be affected by the proposed rule change. When former Gov. Paul LePage’s Department of Health and Human Services imposed the change, about 9,000 Mainers lost SNAP benefits. Perdue’s department said that while food insecurity dropped to 12.7 percent of American households, it went up in Maine to cover almost 16 percent. “Additionally, one in five children in Maine experiences food insecurity,” Pingree said. While King, Collins and Pingree took solid stands against the proposed change, Golden was less clear. He said he would consider revisions to push adults without dependents to get jobs, but he doesn’t want to see changes that would make it harder for children to get the food they need. “Pushing people to find employment is in their best interests,” the first-term House member said. As it is, he said, the Perdue proposal is not something he has to look into deeply or vote on yet, so he is not ready to speak out on it. “I just don’t choose to fight every little battle,” Golden said. To collect the food help, he said, they would have to work or volunteer for at least 20 hours a week to receive benefits for more than three months in any 36-month period. Pingree said, though, that waivers must be flexible, “because states need to respond to food insecurity in ways that work for them” and decried the imposition of “a one-size-fits-all solution” for every state. “I believe that access to food is a fundamental right and am very concerned that this proposed rule will only perpetuate food insecurity in Maine and across the country,” Pingree told the agriculture chief. The letter signed by King and Collins said Congress wanted to mitigate the strictness of the time limits imposed by allowing waivers for states that want to provide more food aid, something every state but Delaware has done at some point. The senators said instead of taking the route pursued by Perdue, Congress chose instead to focus on improved training, workforce partnerships and other measures to help people get and keep good jobs. “These efforts recognize that many individuals face substantial barriers to employment that an arbitrary time limit or unemployment floor do nothing to address,” the senators’ letter said.